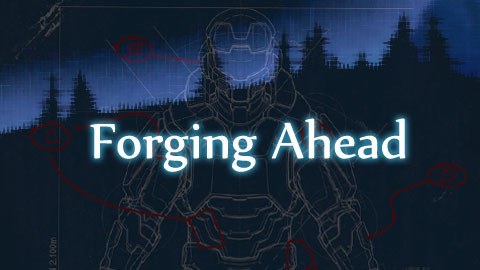 Part 1 | Continuing with the Forge theme of the past few articles, this is the first in what will be an ongoing series about crafting maps in Reach’s Forge mode, from tinkering to designing to play testing. In the first installment, we establish the premise for the series and look ahead to where it’s going soon. Part 2 | Taking lessons learned from the budget limitations of Halo 3’s Forge, we explore the planning process for a large-scale BTB map in Reach using entirely objects from the Forge palette. In planning the foundation of the map, we test the limit of the new Forge’s ability to create enough terrain to support ground vehicles and come away impressed. Part 3 | With Forge stress tested to make sure it can build a big team battle map, we move on to identifying the key design goals of the map, and then constructing a foundation to achieve them. Part 4 | With a foundation set for the map, we test out how well suited the space is for ground vehicles, and get a hard lesson in vehicle physics. The map layout gets its first major revision to account for vehicle handling and to vary the base approaches. Part 5 | After the first major redesign, we start the process of building out the bases and segmenting the sight lines, and in the process make a pair of breakthroughs which solve key problems with the maps flow. Part 6 | After another breakthrough on the design of map’s foundation, we begin the process of blocking out the major sections of the map for infantry and vehicles. And along the way, get a couple of big assists on base design from some impromptu playtests. Part 7 | With the major components of the map roughed in, we add a much needed layer of polish and prepare the map for its final play test by adding in the weapons and designing the spawn layout. Part 8 | After a few weeks of mostly solitary development, Crossroads gets subjected to its first round of play testing. We look at what kinds of feedback came from the sessions, and the adjustments made in response. Part 9 | In the penultimate update on Crossroads we zero in on a series of refinements, with a final polish pass on base design and vehicle movement. Part 10 | After weighing how much the layout impacts players perception of scale, Crossroads gets on last polish pass to address infantry movement, and goes through the final round of playtests. Part 11 | After a brief hiatus on map making after wrapping up Crossroads, we take a step back to evaluate how Forge has evolved from its Halo 3 iteration, and how effective it is as a map creation suite. Part 12 | We kick off the start of a second large-scale map on Forge World by searching for an ideal BTB space, and then speed through the development of the first, untested iteration. Part 13 | The results of the first playtest on Sandybridge is in, and the verdict was a resounding thumbs down. We look at what went wrong, and undertake a near total map rebuild to address it. Part 14 | Forging Ahead breaks its hiatus for a final look at the possibilities – and limitations – that Reach brings to map makers. Epic map dude. Really made me think about the layout of a few maps I’ve made. Very interesting to see the finished result after reading how the map has been evolved and refined. The amount of thought gone into this really shines through on the map. Loving the concept of the neutral bomb being over the middle. Yeah, man! I’ve been checking in on this blog a couple times, and have been pretty eager to play the map. Just downloaded it now, and I’m looking forward to whipping it out when I’m leading a big custom game party. Thank you for your excellent forgey contribution to the Halo: Reach community! French TGVs have been using 300 km/h (186 mph) as their standard cruising speed for many, many years now, and they’ve recently started to go faster on scheduled routes. Germany has TGV-type trains on its high-speed network. Ok, this is probably relevant to something, maybe in one of the entries, but to me and I’m sure the rest of us this just sounds like giberish.